The Andes of Peru have been heavily populated by wildlife for thousands of years, In Inca times all types of Andean wildlife enjoyed a form of protection, and although periodic hunts occurred, these were few and the privilege of the ruling class. After the Spanish conquest and the breakdown of the Inca infrastructure, wild animals were hunted indiscriminately and consequently suffered a population decline which was further advanced by the cutting of high Andean woodlands, which provide essential cover for many animals. Today the persecution of wild animals continues, in some cases because of damage caused by animals to crops, in most cases because of misconceptions. 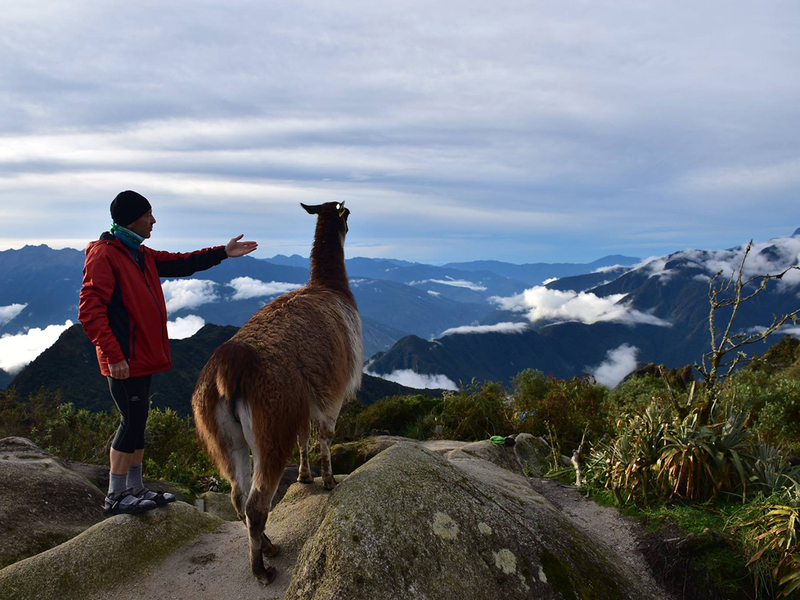 The careful observer, however, can still find a wide variety of Peruvian fauna while traveling in the Andes. The most conspicuous animals encountered by a visitor to the Peruvian Andes are the cameloids. There are two wild cameloids in Peru, the vicuña and the guanaco. The vicuña, reputed to have the finest wool of any animal, has been brought back from the verge of extinction by the establishment of reserved areas for the species, such as the Pampas Galeras reserve in south-central-Peru. They are now to be found in quite large numbers in many areas but are still considered vulnerable. In Inca times, vicuña wool was obtained by running the animal to the ground, picking its fleece by hand and then releasing it. This not only assured a regular supply of wool each year, it also maintained population levels. The modern day illegal hunter resorts to firearms, the primary cause of the vicuña´s demise. Prosecution is difficult, however, since the people who possess guns are often influential or otherwise immune. Fortunately, due to the concerted conservation efforts, the vicuña is making a welcome comeback in the Peruvian highlands. The other wild cameloid of the Andes is the guanaco. This species reaches its northernmost limit in the highlands of central Peru, and from here extends down the Andean chain to the southern tip of South America - Tierra del Fuego. In Peru the guanaco is most likely to be seen in the departments of Tacna, Moquegua, Arequipa, Puno and Cusco and is to be found in isolated rocky ravines with brunch grass. Guanacos are wild relatives of the llama and alpaca but are at once distinguishable from their domesticated cousins by their bright tawny coloration, similar to that of the vicuña. The exact relationship between domestic llama and alpacas and the wild guanacos and vicuñas is not clear. All possible crosses of the four cameloids mentioned have been accomplished and the offspring of all crosses are fertile. Most taxonomists now agree that the domestic llamas and alpacas are a product of the cross breeding of the guanacos and vicuña. Whatever the relationships, the domesticated cameloids are to be found throughout the Peruvian highlands. The only natural enemy of the cameloids is the puma and mountain lion. This large tawny, unspotted cat was much revered by the Incas as a symbol of power and elegance. Unfortunately since the conquest, Andean man has lost the conservationist outlook of the Incas, and the puma has suffered dramatically as a result of indiscriminate hunting. The habit of picking off an unwary llama has not endeared the puma to the Quechua people, and now it is only possible to catch a fleeting glimpse of this magnificent cat as it crosses remote Andean Valleys or stalks mountain viscachas. Two smaller members of the cat family are also to be found in the high Andes. Both species are shy and little is known of their status and habits. The pampa cat is typically an animal of the intermountain Andean valleys although it does occur close to the coast in Northern Peru and in the high cloud forest of the eastern stopes of the Andes. The Andean cat is rarer still and in Peru is limited to the southern highlands. This is a high altitude species, mostly nocturnal, and seems to prey on mountain viscachas. Tracks of the species can be seen at snow line nearly 5,000 meter (16,400 feet) above sea level, but for the short term visitor to the Andes, an encounter with any of the Peruvian wild cats is a rare event indeed.